Steampunk Emma Goldman has posted a review of Catastrophone Orchestra over on her blog anachro-anarcho. Most of the stories contained within the Catastrophone Orchestra reader first appeared in the pages of our magazine, so of course we’re proud to see their work collected in this book! 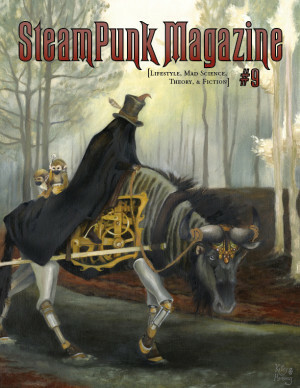 I hear a lot about steampunk as “escapism,” and I find that idea intensely problematic. This book is a journey without being an escape; it transfers the concerns and issues of the real world, both modern and historical, into a universe in which those issues look different, but feel profoundly the same. It doesn’t make you forget real problems, it lets you view them through the greasy, steamed lens of a different, fascinating world. So what is wrong with a little historical, goggle wearing escapism?